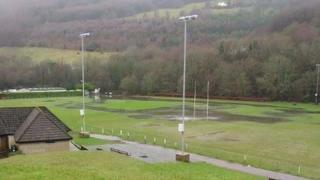 A rugby club has to cancel games after heavy downpours due to rising sewage coming up and flooding the pitch. Abercarn RFC in Caerphilly county said it had become a regular occurrence, although it first started happening about four years ago. Each incident closes the ground for three weeks due to health concerns, leading to matches being postponed. A manhole overflowed again on Saturday. Welsh Water has apologised and said it was trying to find a solution. A club spokesman explained that during bad weather, the pressure of the water running in a pipe beneath the pitch forces a manhole cover off, sending out sewage - including toilet paper and sanitary towels - on to the grass. He said he believed more pressure was being put on the sewerage system with more housing being built in the area. Although repairs have been carried out by Welsh Water, the problem seemed to be getting worse, with about five games cancelled this season involving sides from junior to senior level. A senior match in Division 2 East had to be postponed last Wednesday. "Welsh Water are pretty quick at cleaning it up but because of the contamination the pitch has to be left for three weeks," said the spokesman, adding that players report a bad smell when the pitch is back in use. Welsh Water said the main cause of the problem was "too much rain water entering the system... and we are investigating to see why this has happened". After the latest flooding on Saturday, Welsh Water said it carried out an initial clean-up and would work with the rugby club to resolve the problem. A spokeswoman added: "We have already carried out maintenance work within our network and are currently carrying out investigation work to identify areas where we can reduce the volume of surface water that enters into the system. "We are also carrying out further investigation work to see what long term improvements may be needed to increase the capacity within the sewer network so that we can manage the more extreme weather conditions." The club, which rents the land with other sports clubs, said it was due to meet with Welsh Water officials later this month to discuss the issue. Caerphilly council, which owns the site, said had been in talks with Welsh Water to "resolve the issue".